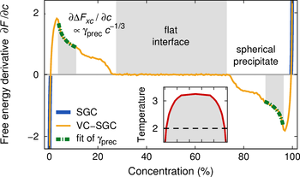 Using atomistic simulations of Fe-Cr alloys and computational thermodynamics techniques, we study the influence of short range order (SRO) on the location of the alpha-alpha’ miscibility gap. 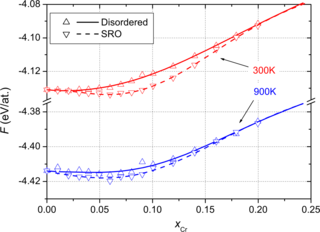 By comparing the random alloy with the short range ordered alloy, we extract the contributions of SRO to the free energy coming from the enthalpy of mixing and from the vibrational and configurational entropies. 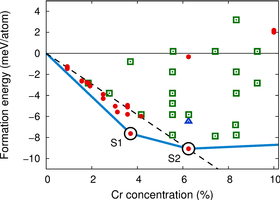 We conclude that the effects of SRO are significant, doubling the solubility limit of Cr at low temperatures (~300 K), and that this effect is mainly due to the contribution of SRO to the enthalpy. 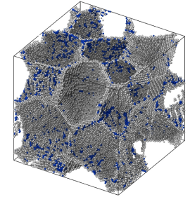 The result is relevant to the nuclear applications of these alloys where irradiation accelerates alpha’ precipitation.